The prime minister made the prediction Thursday during a town hall meeting in northern New Brunswick, where a young Syrian refugee thanked him for allowing her family to come to Canada. "I came all the way from Syria, and I came here to thank you," Tasmeen Ali told the prime minister in a soft voice, her words met with warm applause from the 250 people gathered inside a high school in Miramichi. Trudeau reminded the crowd it was his Liberal government that granted asylum to 40,000 Syrian refugees in 2015-16. He said his government was glad to help, but he stressed it was Canadians — those in church and community groups, neighbourhoods and families — who made the integration of Syrians a success. "Welcoming people who are trying to build a better life is what built this country," he said. But Trudeau's upbeat tone changed when he suggested the world has become increasingly fearful, insular and anxious about immigration. "When we're faced with anxieties, it's very easy to have those fears drummed up and exacerbated — getting people to point fingers and lay blame," he said. There are people trying to create fear, intolerance and misinformation about immigration across Canada, he said, though he did not name any individuals or groups. "But the kind of fear-mongering, the kind of intolerance, the kind of misinformation going on across the country and around the world is something all of us have a responsibility to engage with a positive and a thoughtful way." Conservative Leader Andrew Scheer recently accused Trudeau of being most divisive prime minister, saying he and his Liberal party routinely dismisses anyone who raises questions about Canada's immigration system. Last month, Scheer said Trudeau's approach has been to label people with legitimate concerns as un-Canadian. Scheer's accusations came after Trudeau told The Canadian Press that Scheer and the Conservatives were playing a dangerous game by lying to Canadians to drum up fear over immigration. Scheer's stance against the recent United Nations Global Compact for Safe, Orderly and Regular Migration was one of the things that provoked anger in Trudeau, who said the Tories were lying when they said the agreement overrides Canada's sovereignty. 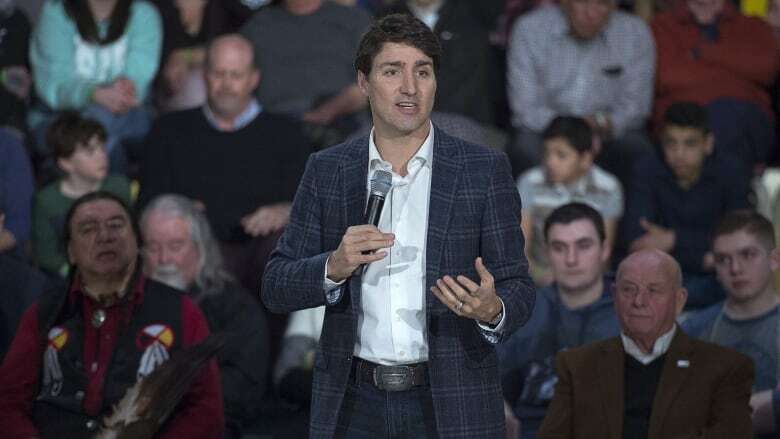 Last Friday, Trudeau repeated that assertion during a lively town hall meeting in Saint-Hyacinthe, Que., where was cheered and occasionally heckled. When a woman wanted to know why Trudeau's government had signed the UN compact without consulting Canadians, the prime minister said the agreement would allow Canada to co-operate with other countries on immigration matters. Trudeau had to raise his voice to be heard above shouts and booing as he blamed the criticism of the pact on the "politics of division." The public meeting in New Brunswick was part of a cross-Canada swing aimed at boosting the fortunes of Liberal candidates in an election year. In the 2015 general election, Liberal candidates won every one of the 32 ridings in Atlantic Canada. As expected, the crowd at James M. Hill High School in Miramichi was more than kind to the prime minister. There were a few other thank-yous, a few requests for photos during the question-and-answer session and no heated exchanges. For more than 90 minutes, a seemingly relaxed Trudeau fielded 16 questions, which included queries about abortion, radon gas, rural development, seasonal employment, Indigenous rights, cannabis, pharmacare and Lyme disease. Earlier in the day, Trudeau said his government wouldn't spend more money on the troubled 2021 Francophonie Games in New Brunswick — unless the provincial government agreed to pay more. Last month, New Brunswick's Progressive Conservative government announced the Games could prove too expensive for the province, as cost estimates ballooned to $130 million — a sevenfold increase. While visiting a child-care centre in Quispamsis, Trudeau said Ottawa would only match provincial spending dollar-for-dollar. "Obviously the Francophonie Games are deeply important to me," Trudeau said. "We think it's extremely important to move forward on the Francophonie Games, but ... we have a framework for large sporting events." Premier Blaine Higgs has said the province will stick with its original commitment to spend $10 million, insisting his government won't spend another penny. The ninth Games of La Francophonie are scheduled to be held in the Moncton and Dieppe area in the summer of 2021, attracting 3,000 athletes and artists from more than 50 member states that have French as a common language. With files from Michael MacDonald in Halifax.